Sailors for the Sea was the Official Clean Regattas Partner of the 34th America's Cup. As the Official Clean Regattas Partner of the 34th America's Cup, Sailors for the Sea was proud to implement our Clean Regattas program which supports a clean and healthy ocean ecosystem. 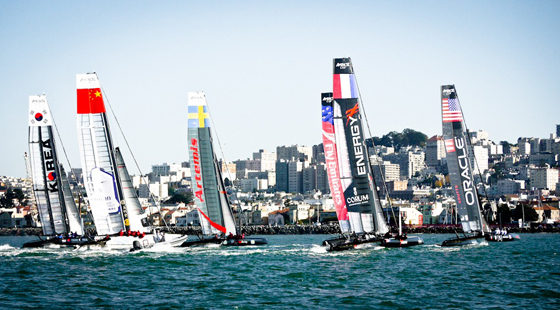 Through this partnership, we helped reduce the environmental footprint of the 2011 - 2013 America's Cup World Series, the 2013 Louis Vuitton Cup and the 34th America's Cup. Sailors for the Sea is the first environmental non-profit organization to partner with the America's Cup in its storied 160 year history! Additionally, Sailors for the Sea engaged with students at 2011- 2013 America's Cup World Series events with our Rainy Day Kits program, environmental lesson plans focused on marine ecology. We were also proud to be a global partner of the 34th America's Cup Healthy Oceans Project, a collaboration between the America's Cup Event Authority and leading ocean conservation NGO's. The America's Cup Healthy Ocean Project focused on three important areas of ocean literacy - increasing the percentage of the oceans under protection, encouraging sustainable sea life choices and reducing the amount of single use plastic that ends up in the ocean - all areas where individuals can take personal action and make a difference. To learn more about our past work with the 34th America's Cup, view our Sailing News blogs.